Right now audiences can see Mark Duplass acting awkwardly beside Melissa McCarthy in the thoroughly disappointing comedy Tammy. But later this summer, a much better display of the actor's talent alongside "Mad Men" star Elisabeth Moss will hit theaters in The One I Love. The indie debuted at the 2014 Sundance Film Festival, telling the story of of a marriage on the verge of breaking down. In one last effort, Ethan (Duplass) and Sophie (Moss) take a weekend vacation for one last shot at saving their marriage. Both Moss and Duplass have been said to turn in spectacular performances, and the trailer certainly shows that, along with a style like Sofia Coppola meets Wes Anderson with a sense of ominous oddity. Watch it now! Below is the official poster for The One I Love, way better than most posters nowadays. 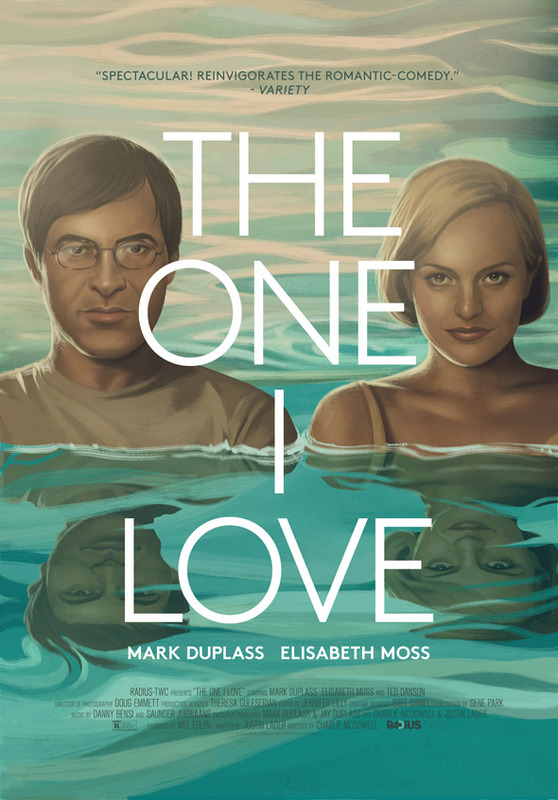 The One I Love is directed by author Charlie McDowell, making his feature directorial debut, with a script by Justin Lader. On the brink of separation, Ethan (Mark Duplass) and Sophie (Elisabeth Moss) escape to a beautiful vacation house for a weekend getaway in an attempt to save their marriage. What begins as a romantic and fun retreat soon becomes surreal, when an unexpected discovery forces the two to examine themselves, their relationship, and their future. The film premiered at the 2014 Sundance Film Festival and Radius-TWC releases the film on VOD August 1st and in limited theaters on August 15th. Good stuff? Did they intentionally leave his glasses off in his reflection on the poster? Quite like Elisabeth Moss so will watch. Agreed. Her performance in TOP OF THE LAKE was outstanding. Yup. Same here. Great actress.